A MOTHER SO DEAR : Reflections and Encomiums Commemorating the 80th Birthday of Mrs. Olusolape Ifaturoti with Brief Autobiographical Notes Compiled by Sade Adefisayo et al. A Mother So Dear was a book project that was commissioned to AMV for full prepress and print production services in 2011 by the family of the subject to commemorate her 80th birthday anniversary celebrated in Ibadan Nigeria.The publication was distributed to members of the subject's extended family and their friends. For information on how to obtain the free e-book version please contact us via e-mail. 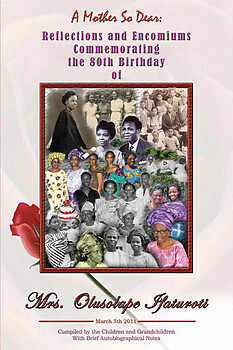 A Mother so Dear is a collection of personal family reflections compiled to commemorate the 80th birthday anniversary of Mrs. Olusolape Folasade Ifaturoti on March 5th 2011. It commences with reminiscences of her five children and those of eight of the grandchildren, all written to celebrate the grand occasion. These are followed by tributes to the celebrant and additional reflections by four of her five siblings, two in-laws and a bosom friend of several decades. The publication is produced for free circulation to members of the extended family and family friends invited to attend celebrations marking Mrs. Ifaturoti’s birthday, including a special Thanksgiving Service at All Saints Church Jericho Reservation Ibadan, followed by a reception organized in her honor to raise funds for the Children of Promise Ministries (CHIPROM) Orphanage taking place at NuStreams Conference Centre, Ibadan. “Mummy”, “Grand Mummy” or “Grandma Idishin” as Mrs. Ifaturoti is often affectionately referred to in this collection is honoured and celebrated for the wonderful virtues and qualities she has displayed over the years as a compassionate and loving mother and grandmother which have made her a very special and central figure in the lives of her children and their own progeny. Their acknowledgement of her special attributes is further buttressed in the tributes by her siblings, in-laws and a long standing friend. Belying Mrs. Ifaturoti’s quiet and unassuming disposition and humility is a life story of rare personal achievements against considerable odds and the overcoming of intimidating challenges which are chronicled in her own words in brief autobiographical notes presented at the conclusion of the collection. The notes which her children coaxed her into providing for this publication were written reluctantly in her characteristic self-effacement, never seeking to draw any attention to herself. Yet shining vibrantly through her humble words are many impressive personal achievements including her sterling secondary school education at Queens College (QC) Lagos in the mid to late 1940s, and her being one of the only two girls in the country to be admitted as undergraduates into the University College Ibadan (UCI) (now University of Ibadan) in 1950 at age 19. Her children are indeed very proud to have her life story told for posterity. They hope the text of the book makes interesting reading for the target private reading audience. It is spiced with photographs depicting both historic events and contemporary times in the subject’s life taken from the family archives. Some of these memorable portraits date as far back as early last century such as the wedding photograph of her parents in 1928. Others were taken as recently as a few months ago including one photo of her attendance at a concert in Lagos at which Mummy was united with a classmate and old friend from QC and UCI over sixty years after they left school. The children thank all members of the extended family and good family friends who have stood by “Mummy” all over the years and being a great support to them all.